GSP and Dana White are having a talk that could impact the entire 170lbs division. At 4pm PST time on Thursday, UFC welterweight champion Georges St-Pierre will talk to UFC president Dana White about his future and how that will affect the promotion and every other fighter in the 170-pound division. 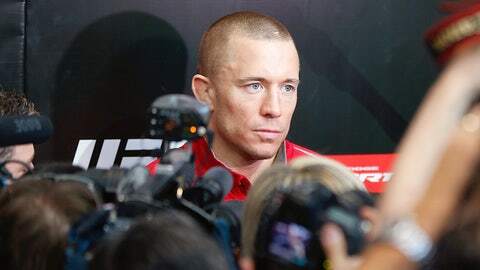 The phone call takes place ahead of a press conference St-Pierre is holding on Friday in Montreal, but as of now even White admits he has no idea what’s going to happen with his reigning and defending champion. Regardless of speculation, White doesn’t believe St-Pierre is going to retire, but until he hears the words come out of his mouth, nothing is a certainty. "I don’t think he’s going to retire, I don’t think that’s going to happen," White said when speaking with FOX Sports. St-Pierre’s decision is long reaching in the division because his next move could impact a lot of welterweights including his last opponent Johny Hendricks and even former interim champion Carlos Condit. I don’t think he’s going to retire, I don’t think that’s going to happen. Now if you’re curious how Condit’s name came up, it’s because the New Mexico native was scheduled to fight at UFC on FOX 9 against Matt Brown until his opponent suffered a back injury that forced him out of the fight. Condit is currently sitting without an opponent, but White believes he will move onto a new fight now instead of facing Brown. Who that will be against and how that timing works out could depend on what St-Pierre does next. "I think Carlos is going to get a different fight. First of all, it all depends on what Georges St-Pierre is going to say to me today when we talk. I don’t know what he’s got going on, but then we’ll make a decision," White said. "Matt Brown’s got herniated discs in his back, that’s not like he pulled something in his leg. What he’s got is no joke. So we’ve got to fight out what Georges is doing and then we’ll go from there." Could Condit potentially be in line for a title shot against Hendricks if St-Pierre decides to retire or walk away from the sport for an extended period of time leaving a hole in the welterweight division in terms of the title? White didn’t want to go any further with the conversation than to say the conversation with St-Pierre will impact everyone in the welterweight division and the match making that the UFC is able to do after today. "We’ll see what happens. I can’t even speculate till I talk to him today," White said. "Then once I talk to him and know what he’s doing, then I can make all the decisions."